Rabat--- Hundreds of Moroccans denounced on Friday, in a peaceful sit-in before the Parliament in Rabat, the publication of satirical cartoons on Prophet Mohammed (PBUH) by some European newspapers. The Sit-in was organized by four Islamic groups namely 'Attawhid Wa al-Islah movement', 'al- Adl Wa al-Ihsan', 'al-Haraka min ajli al-Ummah', and 'Nadi al-Fikr al-Islami'. Demonstrators chanted slogans accusing the western publications of spreading "hatred," asking those responsible for such acts to present their excuses to the Muslim world. Slogans read: “All Moroccans are ready to defend the prophet”, “there is no God but Allah and Mohammed is his prophet”, “this is neither dialogue nor freedom, this is hatred”. The demonstrators also called for a boycott of all Danish products. SMS calling for the boycott are circulating since Friday. Several political figures who attended the demonstration, have criticized the use of freedom of expression to attack millions of Muslims who reject the humiliation of any prophet, from Adam to Muhammad, including Moses and Jesus. Saâd Eddine al-Othmani, Secretary General of the Justice and Development Party told MAP news agency that “the aim of this sit-in is to send a clear message to the international community stating that Muslims won't tolerate any mockery or harm against Prophet Mohammed.” He called on the international community to adopt a charter providing for the respect of all religions. For his part, Mohammed Lakhsasi, MP and member of the national council of the socialist party, denounced the “political drive behind these acts, which aims at harming the dignity of Muslims”. “These acts have nothing to do with freedom of expression; rather, this is a campaign which aims at shaking the principles and values that unite Muslims,” Lakhsasi told MAP news agency. Mohammed al-Khalifa, member of the executive commission of the Istiqlal party also denounced the cartoons and said that this sit-in is a strong and bona-fide condemnation from all Moroccans of any kind of insult against the prophet and Islam”. 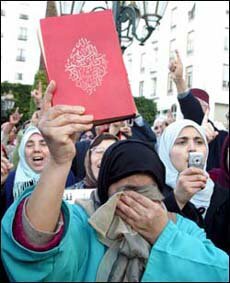 Demonstrators also called on the Moroccan government, parliament, political parties, syndicates, and every official to take the issue of insulting the Prophet seriously, and to officially call on the western governments to apologize for that. They also called on the Moroccan civil society to express their protest and denunciation over insulting Muslims. The Supreme Council of Ulemas, headed by King Mohammed VI, has also condemned the publication of the cartoons, regretting it came to provoke Muslim's feelings. On the same day, the Moroccan government barred the delivery of the Friday issue of French daily 'Liberation', among those who published the cartoons. It also barred the Wednesday issue of 'France-Soir' daily that carried the cartoons and defiantly defended its right to publish them. France Soir's Managing director has been fired for republishing the blasphemous cartoons of the Prophet. The Moroccan Ministry of communication said the banning of France Soir was a reaction to "the intentionally offensive character of the cartoons to the Prophet and the fact that they were a blatant and gratuitous provocation for the beliefs of Muslims." Learning beforehand that Morocco will not distribute its Friday issue in Morocco, the French daily “Le Monde”, which also published on Friday the caricatures, decided not to send its edition to Morocco, Saudi Arabia and Oman, "taking into account the hyper-sensitivity to this issue. In the name of press freedom, more European newspapers ran controversial cartoons: the Die Welt, Spanish ABC and Catalan El Periodico, Italian La Stampa and Il Corriere della Sera, and Belgian De Standaard. The United States condemned the cartoons on Friday, siding with Muslims who are outraged that newspapers put press freedom over respect for religion. Apart from the BBC, which briefly broadcast the drawings on Thursday, Britain's newspapers have so far refused to publish the cartoons, earning them praise from Foreign Secretary Jack Straw. "I believe the republication of these cartoons has been unnecessary, it has been insensitive, it has been disrespectful and it has been wrong," Straw said. To explain the reason for its attitude, the BBC contented itself saying that the drawings were screened in 'a responsible manner' to explain to its viewers the cause of the violent sentiments that had arisen after the republication of the cartoons in different papers in Europe. Meanwhile, Danish Prime Minister Anders Fogh Rasmussen met Muslim envoys to seek calm but said he could not apologise on behalf of the Jyllands-Posten newspaper which first published the images. While Morocco staged a peaceful demonstration against the cartoons, protests in other countries mainly in Palestine, Lebanon and Syrian took other forms. In Gaza City, demonstrators hurled stones at a European Commission building and stormed a German cultural center, smashing windows and doors. Protesters also burned German and Danish flags and called for a boycott of Danish products. In Lebanon, thousands of Lebanese protesters gathered on Sunday near the Danish diplomatic mission in Beirut to condemn the cartoons and managed to set ablaze the embassy, waving black and green Islamic flags in front of the burning building. The most violent demonstration against the publication of the cartoons took place Saturday in Syria, where demonstrators managed to set alight the Danish and Norwegian embassies. Denmark and Norway blamed the inefficiency of security bodies in Syria and said it was unacceptable that Syrian authorities had allowed the protests to take place. Thousands of angry Muslims also protested in other cities around the world, including Pakistan, Iraq, Sudan, Indonesia, and London.